From 58 BC to the mid-5th-century AD, France, like much of western Europe, was ruled by Rome. Their kingdom was powerful and the Romans left a lasting legacy of their civilization in the cities of France, or Gaul as it was then. 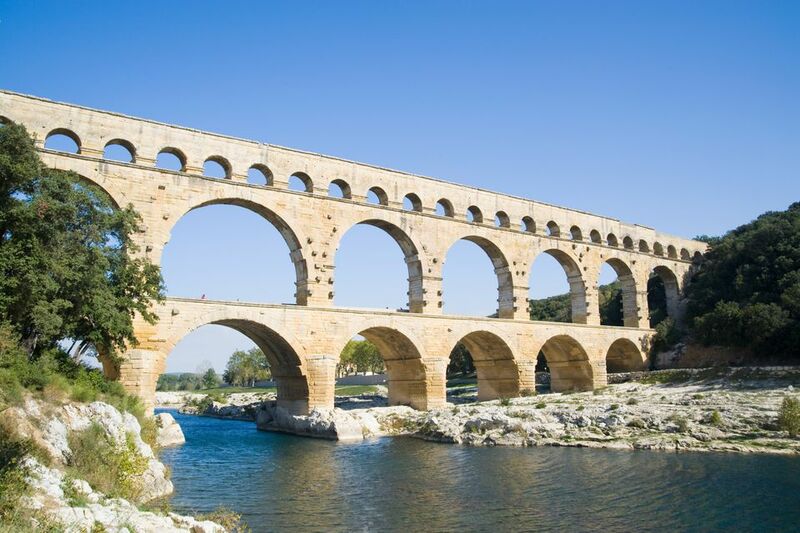 Throughout France, you'll find a wealth of Roman ruins and sites, of amphitheaters which once resounded to the roars of the crowds watching the games, of aqueducts that carried precious water, of temples, forums, arches, and baths. Most of the Roman remains are in the south of France, in Provence which lay so close to the Roman Empire and Rome itself. But there are some surprising places further north, right up to Avesnois in the Nord, part of the new region of Les Hauts de France. Paris, too, seized by Julius Caesar in 52 BC, has its fair share of Roman remains. Arles in the Bouches-du-Rhone is one of Europe’s best preserved Gallo-Roman cities. Arles was at a major European crossroads which brought it trade while industry provided more of its wealth and importance. Start off at the Musée d’Arles Antique (Av 1er Division France Libre) to see the models of the ancient city which bring the ruins you later see to life. It's an excellent museum, light and spacious, and takes the story of Arles from Julius Caesar's legionnaire base to its 5th-century glory. Built at the end of the 1st century, the magnificent amphitheater was huge, with seating for 20,000. It was a typical construction with concealed machinery and cages for the animals under the main stage, and a backstage area for the gladiators who rarely fought to the death to amuse the crowds, despite popular belief. The influence of Christianity brought an end to this particular sport in 404 AD. Today les Arèmes is used for bullfights and cultural events. The Roman Theater was built around 25 BC to amuse the 12,000 spectators with plays and theatrical performances. Today only the stage, columns and orchestra remain but it's still used for concerts and festivals. Orange is a small town just 20 km (12.7 miles) north of Avignon, so an easy distance from the city of the Popes. The gateway to the Midi region, Orange is also an important market center for fruit. Originally founded as the Roman city of Aurisio in 35 BC, Orange's main claim to fame is the Roman theater built between 27 and 25 BC, one of the best preserved from the Roman Empire. The Roman buildings were classified as a UNESCO World Heritage Site in 1981. Built during Augustus’ reign, the theater still has its stage wall almost intact which is what makes it unique. The wall (103 meters, 338 feet long and 36 meters, 118 feet high) makes up the theater’s external wall. Inside, the huge stage which was originally covered by a huge awning now has a glass roof. Divided into three tiers and holding up to 9.000 spectators, you sat according to your social status with the best seats at the bottom nearest the action. Also worth seeing is the Arc de Triomphe. The triple-bayed Arch is just north of the center at the entry to the town on the N7. Built around 20 BC and dedicated to Tiberius, the Arch was part of the Via Agrippa, the famous Roman road linking Lyon to Arles. It’s sculpted with the campaigns of the Second Legion. Get up close to see the carving, still remarkably intact, depicting great battles and the triumphant naval fight of Augustus against Antony and Cleopatra. Just 27 km (16 miles) northeast of Orange, Vaison-la-Romaine was an important Roman town that flourished for four centuries. When the Romans left, the river Ouvèze began to silt up, slowly burying the town beneath the sands. It wasn’t until 1907 that excavations of the Theatre woke up the world to its Roman treasures. Today the town is in two halves: the medieval Haute Ville or Upper Town, and the lower area on the north of the river. Linked to the opposite bank by a single-arched Roman bridge, it was here, near the all-important waterway which acted as a major highway that the Romans built their city. This is the district where life teamed under the Romans. The Praetorium, or courthouse, the theatre, temples, and shops filled the streets where the ground plans of several grand houses remain. Make your way up the hill to the excellent archeological Théo Desplans museum (entrance through Puymin main site) for statues from the houses and porticos of the town. Maison des Messii once belonged to one of the town’s most important families. You’ll see columns and the foundations of various rooms. The Portico of Pompey was built by Pompey’s family, archrivals to Caesar. Built around AD 20, it was largely destroyed in the 5th century where you can see copies of statues (the originals are in the museum). The Roman theatre today seats 7,000 people for its July dance festival. Take the audio guide to help you around the sites. Vestiges de la Villasse lies to the west and is a smaller collection of ruins. Nîmes, on the border between Languedoc and Provence, is a delightful city. It’s known for its spectacular Roman remains but also for its exciting new architecture, courtesy of big international names like Sir Norman Foster, Jean Nouvel, and Philippe Starck. The main focus of Roman Nîmes is the splendid Les Arènes, a beautifully preserved, first-century amphitheater. Huge interior vaulting with corridors and tiers of seats are concealed behind the impressive arcaded two-story façade. Today the screams of the bloodthirsty crowd as the gladiators grimly fought it out are replaced by the screams of the crowds watching bullfights. Nîmes is one of the most important bullfighting centers outside Spain. La Maison Carrée is one of the best preserved Roman temples in France. Built in 5 AD, it was dedicated to the sons of Emperor Augustus. It’s a wonderful, symmetrical building which Napoleon used as the model for the Madeleine church in Paris. It’s located in its own square, giving a wonderful sense of what Roman Nîmes was like. If you’re in Nîmes in the height of summer, one of the most refreshing places is the Gardens. It was built in 1750 on a Roman site and, though the fountains and nymphs at the entrance date from the 18th century, there are various Roman remains left, such as the Temple de Diane. Walk through the grottos of the wooded slope up to the Tour Magne which was once part of the city walls built by Augustus. Climb to the top for the view over the countryside. The Musée Archéologique (Archeological Museum) houses all sorts of Roman artifacts which help fill in the details about life in Gallic France. Also worth seeing are the two remaining gates, the Porte Auguste and the Porte de France and the fascinating Castellum. This is a circular tank built as the entrance for the water brought from Uzès along a 50-kilometer-(31 miles) long aqueduct. From here, lead pipes took the precious commodity to the public fountains and monuments and the private houses of the rich. 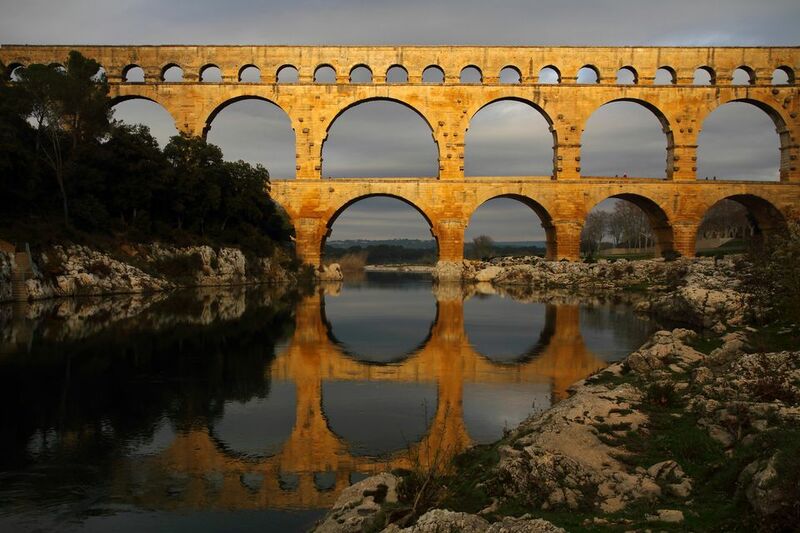 One of the greatest engineering achievements of the Roman Empire, the World Heritage Site of the Pont du Gard is just 20 km (12.7 miles) northeast of Nîmes. It was part of the 50 km (31 miles)-long aqueduct that provided the vital water supply to the city, coming from Uzès. A long stretch survives, giving a very real impression of the skills of the Romans builders. The Bridge is 49 meters (160 ft) high and has three tiers with the top one carrying the water. It was built without mortar and is 275 meters (900 ft) long. There is a multimedia complex at the site with a high tech museum, botanical gardens and many activities for children. It’s an ideal spot for a day trip, with the river where you can swim and picnic places as well. France’s fourth major city has always been important; today Lyon is a vibrant city with a remarkable mix of old buildings, newly refurbished whole quartiers and some of the best food in France to grab your interest. The Romans built their major camp here when Caesar set out to conquer Gaul. Known as Lugdunum, Lyon then became the capital of the Roman Empire’s ‘three Gauls’ of Aquitaine, Belgium and the province around Lyon. Built around 15 BC on Fourvière hill overlooking where the Rhône and Saône rivers meet, the Theatre was able to seat up to around 10,000 people. The site also had a smaller theatre, the Odeon, both of which are used today for performances, and particularly the internationally known Nuits de Fourvière music and film festival held every summer. Sitting on the hillside beside the Roman theaters, the underground museum has an impressive collection of artifacts, running from super statues to the intriguing Claudian Table – an engraving of a speech made by Emperor Claudius who was born in Lyon. It’s a big and impressive museum on different levels with sections showing the importance of Lyon to the Romans. Drive south of Lyon for 30 km (18 miles) and you come to the great site of Saint-Romain-en-Gal – Vienne. Once this great Roman city, known as Vienna, was the capital of a large stretch of countryside covering the Dauphiné and Savoy regions and straddling the Rhône river. Today the site is divided between St. Romain-en-Gal and Vienne. St. Romain-en-Gal is a delightful place to stroll around, taking in the remains of the villas and the grid layout of the streets which bustled with life from the 1st century BC to the 3rd century AD. The site was only discovered in 1968, revealing the residential and commercial area. You see the craftsman’s district with a fulling mill, a commercial section with warehouses and market halls and don't miss the wrestlers’ baths with marble toilets. The Musée Gallo-Romain is a real draw. It’s a modern building located in the center of a large park and has some stunning exhibits very well arranged, keeping you interested all the way through the story. Don’t miss the wonderful intricate models, the statues, and stunning mosaic floors. On the opposite bank from St. Romain-en-Gal, Vienne (or Vienna as it was known to the Romans), forms the second part of this massive Roman site. You should see both Vienne and St.-Romain-en-Gal to get the full flavor of this part of Roman Gaul. You come across a whole slew of Roman sites scattered around the town including twin Roman theatres, and a complete Roman temple. Temple d’Auguste et de Livie has been wonderfully restored. It’s a smaller version of Nime’s Maison Caree, located on the place du Palais. And also see the remains of the Jardin Archéologique de Cybèle off place de Miremont. The Théâtre Antique (Rue du Cirque) is Vienne’s pride and joy, located at the base of Mont Pipet. It was built around 40 AD and with its capacity to seat up to 13,000 spectators, was one of the largest buildings in the whole of the Roman empire. If you’re here during the summer, try to book one of the concerts or best of all, the Jazz à Vienne Festival which is held here. The Musée Archéologique Eglise St-Pierre (Place St Pierre) houses odd Roman artifacts all jumbled together, alongside beautiful fresco fragments and mosaics. One of the less well-known Roman cities, Saintes or Médiolanum Santonum was the capital of the Roman province of Saintonge and the Gallo-Roman capital of Aquitaine for a century. Start with the Arc de Germanicus down by the riverbank, a triumphal arch dedicated to Germanicus Caesar and his uncle, the emperor Tiberius. It originally adorned a stone bridge crossing the Charente river. The Musée Archéologique (Esplanade André Malraux) next door houses artifacts as well as reconstructed walls and pillars. The main tourist site is Les Arènas (20 rue Lacurie). Take the small footpath next to 54 cours Reverseaux and you arrive at the remarkable building and the oldest surviving Roman ruins in France. It’s a surprising, peaceful amphitheater carved out of the hillside seen at its best in summer when a series of free concerts fill the sandy space. Bavay, located east of Valenciennes and north of Le Cateau-Cambresis (check out the excellent Matisse Museum), is a small town known for its Roman remains. It comes as a surprise; the Roman sector is extensive and there’s an excellent museum next door to the grassy forum. Caesar conquered the area inhabited by people he called the wildest of the Belgians. Named Bagacum, and at the crossroads of seven different main routes which led to Utrecht, Boulogne-sur-mer, Cambrai, Soissons, Reims, Trèves, and Cologne, Bavay became the capital of this part of Roman Gaul. The forum at Bavay was vast, covering 2.5 hectares and the largest of its kind north of Rome. 240 meters (787 ft) long and almost 110 meters (361ft) wide, this was the center of the city and the region. Today it’s a green space with massive walls. Inside was the basilica, slightly larger than the one at Carthage at 98 meters (321 ft) long. With Ostia, Bavay was one of the three largest basilicas in the Roman Empire. Also here are the remains of the temple, with very well preserved semi-underground galleries. Today you’ll always see parties of French schoolchildren being taught the elements of Roman warfare and learning with gusto.